Chad and Israel restored full diplomatic relations after 47-year on 20 January 2019 during Israeli Prime Minister Benjamin Netanyahu’s visit to Chad. Chadian Foreign Minister Hon. Moussa Faki Mahamat was elected as the new African Union (AU) Commission chairperson after seven rounds of voting in Addis Adaba on 30 January 2017. Chad and Algeria on 18 March 2014 signed seven bilateral cooperation agreements in key sectors, including trade, information and communication technology, training and education, among others. Chadian director Mahamat-Saleh Haroun's drama film A Screaming Man won the Jury Prize at the Cannes Film Festival on 23 May 2010. Lakes of Ounianga, a site includes 18 interconnected lakes in the hyper arid Ennedi region of the Sahara Desert in Chad, was added to UNESCO’s World Heritage List on 1 July 2012. This is the first World Heritage site from Chad inscribed on the List. Chad and Sudan resumed diplomatic relations on 9 August 2006. The announcement came during a visit by Sudanese President Omar al-Bashir as Chadian President Idriss Deby was sworn in for a third term in office. Earlier Mr Deby cut ties with Sudan after accusing it of backing rebels who attacked Chad's capital, N'Djamena. Chad and Russia signed a bilateral military cooperation agreement on 22 August 2017 aimed at fighting against international terrorism. 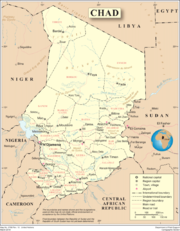 Chad was admitted as a member of the United Nations (UN) on 20 September 1960. Chad was elected as a non-permanent member of the U.N. Security Council on 17 October 2013 for the years 2014-2015.